My latest column for How to Spent It is on a safari jacket made recently with Budd. An interesting project, there will be more about it on Permanent Style next month. In the meantime you can read about the background here. Remember, all previous columns – covering the ‘How to buy’ series and the recent ‘Inside tracks’ can be seen on the site here. You can follow the discussion on Budd bespoke safari jacket by entering your email address in the box below. You will then receive an email every time a new comment is added. These will also contain a link to a page where you can stop the alerts, and remove all of your related data from the site. Looks very nice indeed – and useful. Is that a one-off on their part or would it be possible for others to commission a similar jacket/shirt as well? May I then inquire what fabric you were using for your jacket? And how many fittings was needed? As someone who only occasionally visits London, the last question is of course vital. By the way, many thanks for your inspirational work, Simon! It was a heavy, loose-woven linen. I’ll get the fabric reference for the posts on PS. The implication (perhaps) being that as a one off experiment for publication in the FT, Budd were happy to undertake the work, but would be less inclined to do so for a flood of readers! I see, yes. Nope, they’re happy to do it now. The ice is broken! You do a gross injustice in not showing more photos of what appears to be an exceptional item. However, what I see of yours looks like it has ‘shape’. Would also be good to see what else is accompanying that jacket (trousers, shoes, undershirt). On the subject of summer dress how does a gentleman carry his wallet , phone etc about him when not wearing a jacket and trouser pockets can be seen to be an invitation to pick pockets (especially abroad)? Do we have to rely on the old tourist poach!? The HTSI column isn’t set up for pictures. But as I said, there will be far more on Permanent Style in the coming weeks. As to wallets, your options are to wear a jacket or carry a bag…. Wouldn’t it look a bit stupid wearing a shirt under the safari jacket? Interesting and an attractive result. I do love Budd, although I wouldn’t want to imagine the look on Mr Butcher’s face when the initial request was made! p.s where are the buttons from? I’ve been trying unsuccessfully to persuade Frank Foster to make me one for years. He, of course, made the Roger Moore jackets. Simon, have you got any full photos of the jacket, rather than the arty cropped ones? I’m rather intrigued by it. Hi Simon, I’d like to ask you, what kind of jacket (style, material) could I use at work, I’m an architect looking for something that works at the construction site (sturdy, durable) but that could be used at the office and still look professional. Many thanks. The best things to look at are probably tweed and washed cotton. Very nice. Although you didn’t go for the “full Roger Moore” with a belt and epaulettes! Looking forward to reading more and seeing photos. I actually just had something very similar made in wool (a brown/olive herringbone), which I think will be good for the autumn. This is a lovely piece indeed! Now a question: aside its suitability while trekking across cities such Casablanca or Ouagadougou in the Summer, on which occasion would you wear your Safari Jacket in London? Just curious. A question about your Sac a Depeche – I am looking at a few on eBay, but want to know if it is roomy enough for a laptop, papers, the odd book, a phone etc. 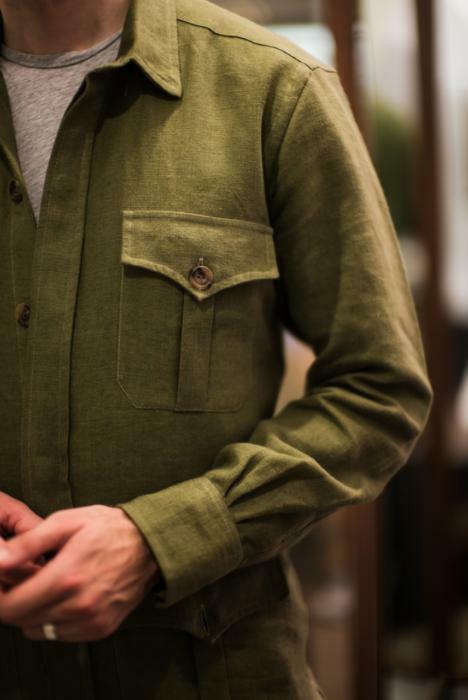 Simon, thanks for setting forth on this project – I love Safari jackets (in context). I bought mine in Italy (rtw) but yours is superior in cut, cloth and, particularly, colour. As with many comments I also look forward to many more pics. Re. comments about what to match it with; I have found that dark t-shirts and shirts work well (particularly dark green and black). A wide variety of trousers also work well from jeans to chinos…surprisingly white also works well (though perhaps not quite as practical). Footwear…I think suede boots are best but I would be interested in your views. Very much looking forward to the finished item, you seem to have hit a sartorial vein of interest with this project! Hi David. Nice to hear from you – those were great shoes! I would avoid trying to do this with a tailor. A Safari jacket should be light and unstructured. From a shirtmaker rather than a tailor. And much as I like this jacket, I would consider getting one RTW (eg from Drakes or A&S) and having it altered if necessary. The material on this Budd one was never quite right, and as the shirt can be fairly loose fitting, I think the material and style is more important. I would also, in retrospect, have had two chest pockets and no hip ones (as the Drakes one has). Thanks Simon. I saw Luigi on Saturday to pick up something and discuss the safari jacket. He feels a safari is right up his street. I confirmed no canvas in the chest (sì), shirt shoulder with no padding at all (sì), five buttons up the front (sì). Went through some photos to confirm. Luca said it was definitely a commission for Sig. Solito and not for Sig. Avitabile. So am going ahead, albeit with some trepidation given your advice. I will let you know how it goes. Am from Sunny Singapore and am increasingly exploring casual outerwear to layer during overseas holidays to cooler climates. I’ve been looking at the armoury city hunter jackets and also at their heavier tweed safari jackets (by ascot chang) and am wondering what are your thoughts on them and what are some of the factors one should consider in the purchase of one over the other. I often bring sneaker and loafers so I could go very casual or smart casual. Thanks for your advice! I really like the city hunter jacket, but largely as a day-to-day replacement for a navy jacket at work – so perhaps not quite as versatile. However, I do prefer that design to the safari jacket – the city hunter feels fresher and modern. I hope that’s helpful. Hard to give a complete recommendation without a big breakdown of everything you’d normally wear with them. Thanks Simon. Agreed on the point of navy city Hunter as an informal replacement for a sportscoat. I’m wondering what are your thoughts on the olive city Hunter and whether it would straddle the smart and casual – not as smart as the navy one but yet being very appropriate to wear casually with new balance sneakers and the like which I often wear to walk long distances. So like a smarter and more urbane safari jacket in that colour? Thanks Simon. If you have tried on the city Hunter, would you say the overall fit is still ‘tailored’ as compared to a field jacket?